I love to tweak my blog every now and then. I like to do it myself because I cannot afford to hire the services of fabulous web page designers like my Marce Kaye. I am not knowledgeable about html codes either so that I had to do my research first, do trial and error with my blog template and search for free tutorials online. I tell you it was a lot of hard work but very worth my while nonetheless. I am glad that there are now lots of blogs dedicated to helping other bloggers create their own home in the blogniverse by customizing their blog layouts. I am referring to one blog in particular: The Blogger Hub, which is a blog written by a woman and is essentially "a blog dedicated to tech talk, blogging basics, toots on how to customize and do whatever with your blog or site". Sounds too good to be true but you better believe it. I would recommend this site to anyone who is just starting out with blogging and is trying to create that one look that is distinguishly his/hers or those who have been blogging and got tired of their generic blog layout. The blog entries are very easy to understand... The author made sure that everything is presented in a very simple manner as possible. I like the author's writing style because it feels like she is just talking to me while we are peering over the computer monitor. One can find various topics featured here: techie gadgets, website design, contests, blogging, tips and tricks. I really enjoyed my first visit to this blog. The header is just very welcoming and will indeed make you feel as if you are entering a hub where you can find everything that you need to know about blogging. This blog is published on Blogger and has a three-column layout with just the right amount of gadgets. 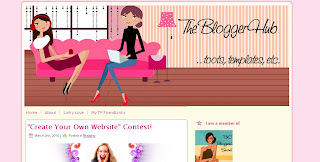 I hope you enjoy your visit to The Blogger Hub as much as I did! grabbed your badge under my lnks..
Nice mga design ni Mommy Kaye. galing naman nila mag design sana may talent din ako nito kaya lng kulang oras sa blogging, LO design pa kaya na nakakajologs ang mga codes. I am lost of review sometimes I need check if I do them.